Modelers do it with glue! So last time I mentioned the fact that I was casting things in Plaster of Paris and coloring the plaster. At first, I did some research on the internet and a few options came up, including using weathering powders, Rit dye, tempera paint powder and cement pigments. Now what you’ll notice about all these options is that they are powders. Some of them work and some don’t, or at least not very well. I first saw how to color plaster for modeling purposes on this Youtube video, which I do recommend. He does a great job on all his videos. His method is to combine weathering pigments with water and then “paint” the mold he’s using. The results looked pretty good in his video. I tried to replicate his efforts, but after several failed attempts with weathering powders, I rewatched the video and realized that he was painting the pigment into the mold and also putting it into the plaster. Now he does say it would take a lot of weathering pigment to color a lot of castings. When I got the method to work, it did not color the plaster completely, but did give it more of a tint. In this example, I put the powder directly into the mold, then poured the plaster. Didn’t turn out so well. Second try. I painted the mold with the powder after using homemade mold release. Enough powder stuck to the bottom of the mold to coat the bricks, but the rest of the plaster is still white. In this example, I painted the mold with the weathering powder and mixed some into the plaster. Looks better! In this casting, I tried another color of weathering powder, just for kicks. This casting only has weathering powder on the brick face. Using more weathering powder is the way to intensify the color, but how much more is up to you. If you use powders like Vallejo (like I did) or AK, it could add up to a lot of money. In any case, weathering powders can only color plaster so much. Next time, how using Rit Dye works. I’ve been learning to cast plaster lately and I’ve learned a few things here and there, mostly how important it is to make a proper mold and the consistency of the plaster. I don’t use anything fancy, just regular Plaster of Paris. I use it because I can easily damage it and make rubble if necessary. Other types of casting materials are much harder and great for purposes such as wargaming, but I just use it for dioramas. So to get to the point, why would you want to color plaster? Well, for one thing, if you have a plaster piece that gets chipped, that spot will stand out quite brightly among your terrain or diorama. Not good. This is worse if you are a wargamer and your terrain pices get a bright white ding to repair. So what to do? I’ll tell you in the next post. Happy Flocktober everyone! Here is a selection of videos on how to use flock and related scenery materials! Enjoy! The battle of the Somme lasted from July 1 to November 18, 1916 and resulted in 420,000 British casualties. This book is a visual record of the trials they endured and showed the conditions the soldiers had to suffer. The black-and-white photos show a variety of situations during the battle and are presented in chronological order. The photos are preceded by a map of the area and a small amount of text describing the overall conditions of the battle. If you are familiar with World War I and the Battle of the Somme, you will know some of the locations and tactics called out in the text of the photos. If not, there is no problem as the photo descriptions are informative. 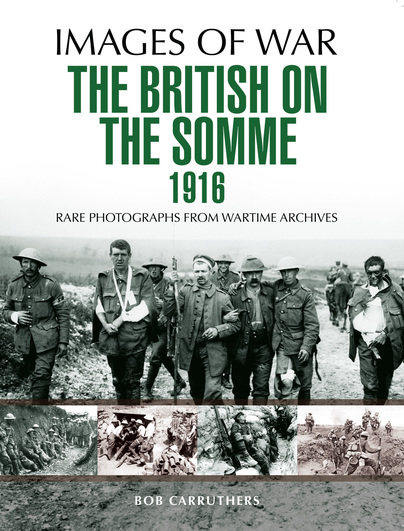 The photos present all sorts of scenes during the fight for the Somme. Some of the most moving are photos of soldiers simply getting everyday things done. Shaving, getting a haircut and taking a much-needed shower are all shown here. Daily needs do not necessarily stop for war. Preparations for the artillery barrage before the start of the battle are shown by the photos of gun batteries with piles of ammunition ready to go and the ammunition dumps behind the lines. The aftermath of the bombardment is also documented by the photos of the huge piles of spent shell casings. At the start of the battle the British fired over 1.7 million shells. Unfortunately, this initial assault did not tear up enough barbed wire or crush the German trenches as they hoped. The photos of Tommies in captured German trenches show mostly intact dugouts and reinforced positions. The British were probably very surprised when they found their initial barrage did so little damage. One thing the photos bring out especially well is the terrain and the weather conditions during the battle. Many show the results or rain on soil that has neither grass nor trees to hold it. The result is a sloppy, gooey mess that bogs down transport and makes attacking difficult. The text makes the point in one photo of men washing with water from a large depression on the battlefield that one should not look too far into the water because it often concealed human or animal bodies. This brings home the truth about battlefield conditions. Men had to fight in an area that was devoid of forests, fresh water, clear terrain and cover. There are photos of casualties, wounded and dead, from both sides of the lines. There are also photos of soldiers relaxing or sleeping, working or evacuating the wounded and lining up at what may be the world’s first food truck. In short, everything people do during war is well represented here. The historian and modeler will be interested in seeing what the conditions were like during the Battle of the Somme. It is also a fitting memorial to the men who fought. Here’s a few videos on how to model different types of water. There are special products for this, but some people like to try different things. Check them out and see if you can use them. Another exciting edi… on Now is this olive drab?